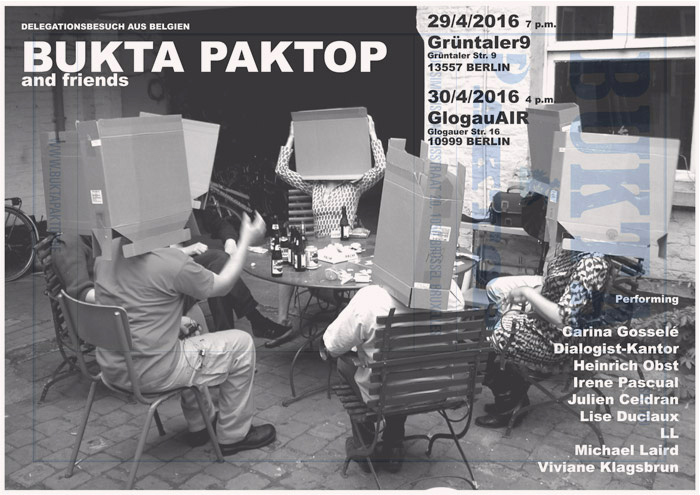 During the Berlin Gallery Weekend the Performance-collective ‘Buktapaktop’ from Brussels will be present with a small delegation from the group accompanied by some friends from Antwerp & Berlin. They will be presenting work at Grüntaler 9 on Friday evening the 29th of April during the ‘Süpperclub’ – intervening in the kitchen as well as in the space itself. On Saturday afternoon they propose a tea-time (Kafeetisch) pop-up exhibition and various performance presentations at GlogauAIR from 4 p.m. - with evening presentations commencing at 7 p.m.
Buktapaktop is a loose artistic ensemble operating a performance venue in Brussels, Belgium. Its core group consists of eight artists (one duo) that operate individually as well as in group, depending on the situation at hand. The name derives from the depression-era colloquial for reconstituted smokes: “Flor de Buktapaktop” – essentially a hand-picked selection of butts found in the street, used to make new cigarettes. This diverse group often operates & interacts in the public space, as well as in like-minded, alternative venues. Often departing from a brainstorming session around a (bukta)table, this project for Berlin also proposes a reference to dinnertime, table, round or square, “Kaffeetisch” (tea-time, coffee-table) as basic premise from where various presentations and activities emanate. It can be seen as a return visit from the recent intervention by Berlin based Patrick Morarescu at Buktapaktop Brussels during the terror-lockdown in November last year. LL & Heinrich Obst (B/D) often collaborate loosely in various ways, often in a hidden, deflective sort of manner, under different guises and formats. Viviane Klagsbrun (B) has retreated somewhat from a background of performance, aktionismus and communality to concentrate on her essential medium of painting and drawing, mainly as an ongoing process of creation and destruction.